The official homepage of Awesome Ultrasound Simulator, an iOS app for simulation point-of-care ultrasound in standard medical simulations. Use it together with your standard mannequin and you've instantly increased the fidelity of the simulation beyond what you thought possible. This is both thew cheapest and best thing you can bring to simulation, try it out! To excel, you have to "Train as you fight, and fight as you train". Ultrasound is the main tool for point-of-care diagnostics in todays health care, but we have not had any way to include this modality in our simulation training. Use this App in your medical simulation, in your CPR training, your ATLS or trauma simulations, and you can from now on incorporate POCUS in your scenarios. It's truly an Awesome Ultrasound Simulator! Connect two devices running the App, using one as a monitor and the other one as a remote. 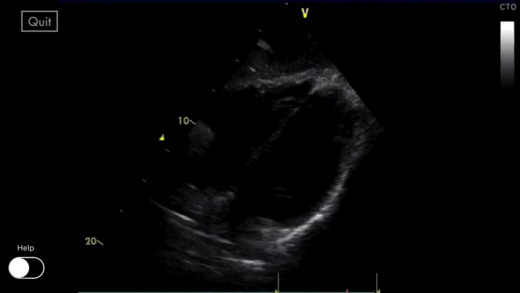 Simulate a full ultrasound examination of pleura, lung base, heart (PLAX, A4C and subcostal view), the three points of the FAST exam, the aorta and femoral veins. Setup your own case by assigning different pathologies including pneumothorax, pneumonia, a diverse set of heart pathologies, abdominal bleeding and DVT. Images are mostly of my own recording or have been given to me by friends. It's amazing what you come by in your regular practice if you look for it! Development of this app have taken place on irregular occasions during my 8 month long paternity leave, in evenings and spare time. Who are you then, with three kids and now an app? I am a 34 year old male doctor, currently in my last year of residency in anaesthesia and critical care at Centralsjukhuset in Karlstad, Sweden. I take great interest in medical education, ultrasonography and critical care, and created this app as a tool for my own training at my hospital. Hopefully others will find it useful as well. I have, over the last year, consumed a sh*t load of FOAM content, and are eager to produce my own. Hit me up @bysnrk on Twitter, or email me.